In the late 18th Century, the fast growing population of the emergingUnited States of America showed the increasing interest in the Wild West. Millions of poor immigrants were arriving from Europe, and the popultation of cities on the East coast swelled enormously. Endless plains and huge mountain ranges - thinly populated by Native Americans and rich in game, farmland and minerals - started luring large numbers of them. Settlers travelled in wagon trains, and established themselves even further west until they finally reached California and the Pacific coast. 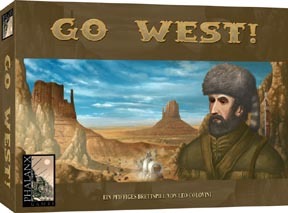 The players represent shrewd business men who benefit from passing wagon trains, continuously moving westward across the North American continent. It is divided into huge regions of land: New England, the East Coast, the Great Plains, the Mid West, the West and finally California.